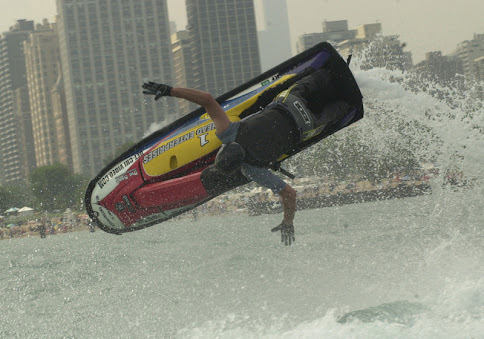 Liquid X Freestyle or LXF was founded by Pro jet ski freestylers and the first jet ski freestyle only tour in the United States. The LXF Tour first hit the water in 2000 at the Chicago Air & Water Show for a 3-Round National Championship. Among some of the top riders that have the tour include multi-time Champion Gary Burtka, Greg Brock, Jason Stoyer, Warren Fedderwitz, Joe Eckert, Mike Widdes, Mike Niksic, Mike Hoffman, Mack Schwab, Brian Tenor, Tommy Nuttall, Devin Hoover, Matt Bol, Khan Funk, Rose Nuttall to name a few. Honorary announcers and judges include Pro Freestyler Mike Hoffman & former Nation Pro Ski Champion Mike Remar. Liquid X is Sanctioned by TAG Racing, one of the nations largest racing organizations, focusing primarily on kart racing.